Still helping with recovery in Houston, UNICEF is mobilizing in the wake of Hurricane Irma. Hurricane Irma is one of the most powerful storms ever recorded over the Atlantic Ocean. The deadly Category 5 storm tore through the islands of the Caribbean with sustained winds of up to 185 miles an hour, leaving a trail of chaos in its wake. Communication networks are down. Roads, bridges, hospitals and schools are damaged. 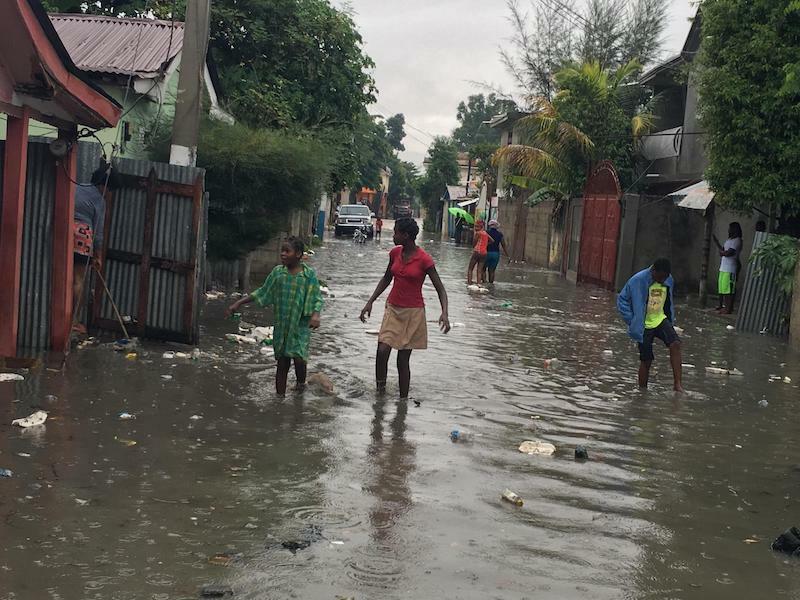 Children and youth in communities across the Caribbean urgently need humanitarian assistance. Damage assessments are still underway in the hardest-hit areas of Cuba, Haiti, the Dominican Republic, Anguilla, Barbuda, the Virgin Islands and the Turks and Caicos Islands. After leaving the Caribbean, the storm carved after a path of destruction up the middle of Florida. Evacuees face a desperate plight. Millions are without power. Families everywhere are focused on emergency preparedness. Meanwhile, as recovery efforts proceed in Houston after Hurricane Harvey, Hurricane José remains a potential threat, and Mexico has suffered a one-two punch after Hurricane Katia struck hard on the heels of a magnitude 8.1 earthquake, one of the most powerful ever to hit the country. UNICEF has pre-positioned emergency supplies for dispatch, including drinking water, sanitation equipment, nonperishable food, medicines, tarps, blankets and emergency education kits. The UNICEF Supplies Division warehouse in Copenhagen, the largest in the world, can ship aid anywhere in the world in 48 to 72 hours. In the weeks and months ahead, UNICEF will be helping children affected by Hurricane Irma resume their educations. UNICEF is an expert in providing education programs to children in need. In 2016 alone, UNICEF supplied learning materials and other support to 15.7 million children, including 11.7 million children affected by war, natural disasters and other humanitarian emergencies. Information can be vital to safety in an emergency. To ensure that storm-affected populations have access to information and are able to communicate, UNICEF has activated its U-Report platform, designed to allow youth and adolescents to send messages via social media platforms. The number of youth asking to receive these messages has been increasing rapidly over the past 48 hours, particularly in Haiti and the Dominican Republic. UNICEF has first responders on the ground throughout the Caribbean who are mobilizing humanitarian supplies, including water purification tablets, hygiene kids, tents and educational materials. "As we work with our partners over the coming days, our most urgent priorities are to ensure the availability of safe drinking water, provide psychosocial support to affected children, restore the education system as quickly as possible, and protect children vulnerable to abuse and exploitation," said María Cristina Perceval, Regional Director of UNICEF for Latin America and the Caribbean. In Houston, UNICEF continues to coordinate Hurricane Harvey relief efforts with local governments, focusing on getting children back to school. Hurricane Harvey has left more than 1 million children in Texas unable to start school, with up to 3 million impacted across the region. UNICEF is working with the Houston Department of Education to set up safe interim classrooms, support and train teachers, and provide critical school supplies to ensure that children whose lives were turned upside-down by Hurricane Harvey can get back to being children and building their futures. Read more about UNICEF's response to Hurricane Harvey here. In 2016 alone, UNICEF responded to 344 humanitarian emergencies — from conflicts to natural disasters — in 108 countries. When Hurricane Matthew slammed into Haiti in October, 2016 — the worst storm the impoverished nation had seen in decades — UNICEF was ready, providing clean, safe water, cholera vaccinations, and emergency medical supplies, repairing damaged schools, and establishing Child-Friendly Spaces with trained volunteers, where children could receive emotional and psychological support. And after a massive earthquake rocked Ecuador in April, 2016, UNICEF supplied thousands of children with emergency nutritional supplements, clean water and essential relief services. UNICEF puts children first in emergencies, steadfastly committed to addressing the needs of the most vulnerable children in the world. The best way to help get relief to the children most in need is to donate now — and spread the word that help is needed by sharing UNICEF's messages via Twitter and Facebook. Text RELIEF to 864233/UNICEF to make a $10 donation for children impacted by natural disasters.